The PANDUIT NETWORK CONNECTIVITY GROUP provides leading solutions for cable routing. These routing products are compatible with Panduit's cable management solutions increasing your ability to maintain an orderly and clean work environment; implement quick and easy moves, adds and changes; and maintain the integrity of your fiber and copper cabling plant in order to maximize long term performance. What is a Cable Routing System? A Cable Routing System is a collection of channels, fittings, and mounting brackets that can be assembled to create a structure that protects fiber optic and high performance copper data cabling from physical damage that can disrupt or cut off signal transmission. It also provides a versatile, scalable pathway that reduces the costs associated with maintaining existing network operations and implementing new services. Cable Routing Systems are not just a means of containing cabling deployed in data centers or central offices. They are an integral component of the overall cable management system needed to ensure optimum network performance. Can you afford improper cable routing? Network problems can cost large companies hundreds of thousands of dollars. A recent study found that companies can lose as much as 3.6% of their annual revenues to network downtime and service degradation1. Contributing to this is improperly routed or unprotected fiber optic cable, which is susceptible to various types of damage. Crushing, pinching, or microbending can result in impeded signal transmission and cable breakage. Bend radius violations, or macrobending, in fiber optic and copper cables can increase attenuation affecting overall system performance and cause fatigue leading to long-term signal failure. Therefore, improperly routed cables are at risk of being damaged and can result in service interruption and downtime. Identifying, testing, removing and replacing a damaged cable is costly in terms of labor and network service interruptions. A properly designed and installed Cable Routing System carries cabling along a logical route to minimize bends and optimize cable lengths while providing easy access to make moves, adds, or changes. A well-engineered and installed Cable Routing System costs a fraction of the potential downtime losses and day-to-day operating costs over the life of the network, thereby reducing the total cost of ownership. The FIBERRUNNER and FIBER-DUCT Routing Systems consist of channels, fittings and brackets designed to segregate, route and protect fiber optic and high performance copper cabling. Typical applications include data centers and Telco Central Offices where cable is routed from distribution areas to equipment cabinets or racks. They can be deployed overhead or in approved underfloor installations. Available standard colors include yellow, orange and black. PANDUIT provides innovative solutions for routing fiber optic and high performance copper cabling to and between equipment racks within a data center, telecommunications room, or service provider facility. The PANDUIT FIBERRUNNER Cable Routing System ensures maximum network reliability and reduced cost of ownership. Robust, highly engineered components with integral bend radius control surfaces can be configured to meet virtually any network application to provide optimum cable protection and assure network performance. Fast and easy to deploy, this scalable cable routing solution reduces installation cost and speeds implementation of new services. Routing products such as the FIBERRUNNER Routing System are critical factors in your ability to quickly install, easily implement moves, adds, and changes and maintain the integrity of your fiber and copper cabling plant in order to maximize long-term performance. Ensure network reliability with a complete solution that protects cables from physical damage while maintaining signal integrity and delivering reliable network performance. Reduce installation costs with innovative snap-together couplers, mounting brackets, and accessories that require minimum use of tools and small fasteners to assemble. These components are part of a comprehensive system that provides lower installed cost. Enable future growth or modification with a complete offering of sizes, fittings, and mounting options that make this system one of the most versatile cable routing solutions available. Routing Cable Out of the MDA The FIBERRUNNER Cable Routing System includes vertical tee fittings for routing cables out of the MDA racks. These fittings can be sized for the anticipated cable capacity and positioned directly above the vertical cable managers to create as direct a pathway as possible. Transitioning Cables Into the EDA Cabinets The FIBERRUNNER Cable Routing System offers a wide variety of spill-out options to provide safe, accessible transitions to the cabinets in the EDA. Spill-over fittings, which can be attached to any straight section of channel, can be used at the initial installation or retrofit into existing configurations as the network changes or grows. Transitions to Other Channel Sizes Reducer fittings are available to provide a method of transitioning between different FIBERRUNNER Cable Routing System sizes. In addition, 12x4 tee fittings and 4-way crosses with integral 6x4 exits can be used to create feeder runs. 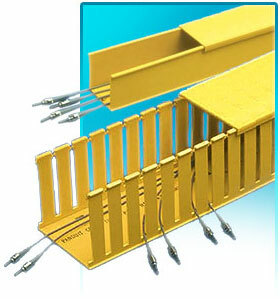 PANDUIT provides leading solutions for cable routing. These routing products are compatible with Panduit's cable management solutions increasing your ability to maintain an orderly and clean work environment, implement quick and easy moves, adds, and changes and maintain the integrity of your fiber and copper cabling plant in order to maximize long-term performance. The FIBER-DUCT 2x2 and 4x4 Routing Systems are comprised of channel, fittings and brackets designed to segregate, route, and protect fiber optic cable and copper cabling. 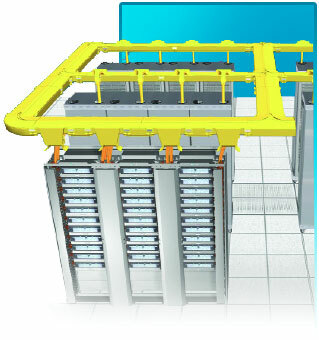 It is suited for data center applications where cable is routed from distribution areas to equipment cabinets or racks. It is used in Telco Central Offices to route fiber optic jumper cables between fiber distribution frames and equipment bays. It can be deployed over the racks or in approved under floor applications. Fittings maintain a minimum 2" bend radius to protect against signal loss due to excessive cable bends. Available system colors are yellow, orange, and black to differentiate various types of cabling. A full complement of brackets is available to attach system components to support structures found in all applications. The FIBER-DUCT 2x2 and 4x4 Routing Systems are part of the PANDUIT complete fiber distribution system, which includes the FIBERRUNNER 12x4, 6x4, 4x4 and 2x2 Routing Systems, cable management, and racks. The 2x2 and 4x4 FIBER-DUCT Routing Systems are comprised of channel, fittings, and brackets designed to segregate, route, and protect fiber optic and copper cabling to and between racks within the telecommunications room. Large capacity 2" x 2"